Do you remember Cabbage Patch Kids? Maybe you adopted one of your own as a child or were among the parents who spent hours in line trying to buy one in the 80s. They were certainly a hit, but do they have any value to the doll collector? As popular as these huggable dolls were, Cabbage Patch Kids are not the most valuable dolls on the market. Only rare dolls have any real value to the collector. As they are introduced to a new generation, though, we may see that change. Who made the Cabbage Patch Kids? The Cabbage Patch dolls (also known widely as 'Cabbage Patch Kids') were created by Xavier Roberts. He began to produce the dolls through his Babyland General Hospital in Cleveland, Georgia in 1979. The dolls were displayed in a hospital-like setting and were "up for adoption." Cabbage Patch Kids were an almost instant hit. They quickly became popular among kids throughout the United States and in the 1980s, it seemed like almost every little girl had one. Coleco bought the rights to mass market the dolls in 1982. After Coleco filed for bankruptcy in 1988, Hasbro (Mattel) took over the dolls in 1994. In 2004, Play Along Toys and 4Kids Entertainment re-introduced the dolls. After the initial craze in the 1980s, the dolls never recaptured their former glory. The dolls started to get gimmicky and strayed too far from their original concept of being sweet, huggable, and adoptable. The re-introduced 2004 dolls have tried to return to this concept and are very similar to the original dolls. What size are Cabbage Patch Kids? 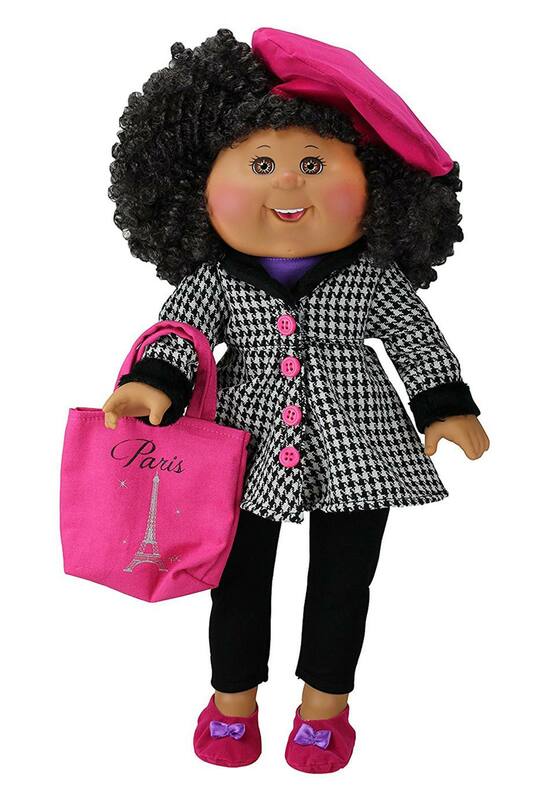 Standard Cabbage Patch dolls run 15-16" in size. Variations of the dolls have been made in many sizes. The dolls generally have decal features and yarn hair. They have chubby faces, arms, and legs. The Cabbage Patch Kids, in their classic vintage Coleco form, had soft cloth bodies and vinyl heads. The Xavier Roberts Babyland General Cabbage Patch Kids were all cloth, with cloth-sculpted faces. Several all-vinyl versions were made by Hasbro and Mattel. The 2004 incarnation reintroduced the classic soft cloth bodies with vinyl heads. A few collector Cabbage Patch Kids have been made in porcelain. Prices for vintage Cabbage Patch Kids are generally low because so many were made by Coleco. There is, however, a huge secondary market as a quick search for Cabbage Patch Dolls on eBay will show. Certain dolls, such as some "Baldies," "Red Fuzzies" (rare red yarn-like fuzzy hair), and some of the other very early Coleco dolls bring over $100. Pre-Cabbage Patch Xavier Roberts dolls can bring over $1,000. Most dolls sell for $10 to $30 and have not changed much from the original retail price. Cabbage Patch Kids defined the word "fad" in the 1980s. Every child wanted one. It seemed that every mom and dad in the United States spent frantic days searching for Cabbage Patch Kids to put under the Christmas tree. The dolls clicked with the general public because they were so ugly they were cute. They were also huggable and the adoption aspect of the dolls was something new that added to their appeal. What goes up must come down, however, and after the boom came the bust. Cabbage Patch Kids became much yesterday's news by the late 1980s. Even with doll companies such as Hasbro and Mattel trying to make a go of it, they never regained their former glory. The late 2004 re-release of the Cabbage Patch dolls was quite successful. A new generation of children begged for the dolls under their Christmas trees and Gen-Xers with fond childhood memories also bought the new Kids. Only time will tell if they will again be a lasting and influential presence on the doll scene.